Here's the new thread for the Rugby League Season SLXXIV and the usual Q&A. Come on RL'ers, I know you're out there! 2. Your highlight of last season? 3. Your expectations this season? 4. Your most anticipated new signings? 5. Who you think will win the league leaders shield? 6. Who will be the dark horses of the competition? 8. Final league position of your club? 9. What (or who) will be your clubs weakness next year? 10. Who promoted from Championship? 2. Probably beating Leeds at Headingly in the Middle 8s. It was an exciting match and was good to beat them on their home turf, in what turned out to be an extremely valuable two points given we then lost at Toulouse. 3. As is every year, to be in the top 8. 4. Probably Drinkwater. He wasn't all that when he played at Leigh but he definitely made Catalans year last season. He's looked decent already, but I'm, also pretty excited to see how Garbutt and Linnett go (forward and second row respectively). Not seen too much of Linnett so far but he's a proper unit! At last our pack finally has some decent size to it and they could really lay a platform for the backs. We have decent quality cover there too with the likes of Lannon, Scruton, Garbutt, Mulhern, Jewitt, Masoe. Hauraki looks like a man reborn in these latest friendlies and is definitely pushing a strong case to be picked at loose forward. Keinhorst too is a great signing, always been a fan of him at Leeds and he's really shown up well in the friendlies, strong defender, decent go forward and knows where the tryline is to force himself over. But gutted Adam Quinlan is injured for most of the upcoming season, he was awesome last year. Bit of a mystery who will play at fullback, possibly Dagger, but more likely Atkin. I was going to say I'd think Cas may struggle this year, but they played well against Leeds today so who knows. Some people say that the year they got to the GF they had a team worthy of a wagebill of £3M whilst only paying the £1.8 cap limit, hence they have been a bit hamstrung with limited signings lately as wages for key players have likely increased. 6. Hull KR! Misplaced optimism, I'm sure. But I really feel we could shock some people this year. 7. Team to play against FC, not necessarily our best team. But somehow Sheens has to find a place for Vaivai as he's a brilliant centre. This year we have some really good selection headaches. 9. Fullback may be a bit of our Achilles heel this year. With Quinlan injured, we need to put somebody else there. Would be good to see Dagger there but he is a very young lad with terrifying pace and good quick hands. Can't see Sheens picking him sadly and will likely go for Atkin. Shame on Dagger, but with Drinkwater and Mags in the halves, its harsh not to pick Atkin. Mags likely to spend time out injured this year so Atkin is very decent cover. 10. Toronto. They have a really good side this year and a decent coach. Can't see past them. 1. Your team? 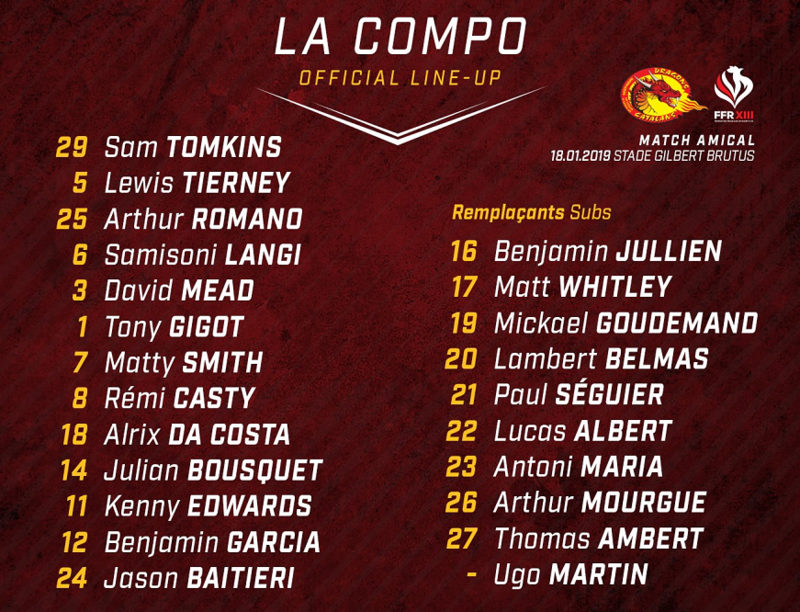 Catalans Dragons. 2. Your highlight of last season? Toss-up between the Challenge Cup win, and just the way we turned the season around from the bloody awful start we had! 3. Your expectations this season? The usual. We'll compete, and we'll play good rugby, but we won't top the league. 4. Your most anticipated new signings? Tomkins. Going to be interesting to see how he slots into the side, but they had a good run out in the friendly against the President's XIII the other day. 5. Who you think will win the league leaders shield? Really not sure. 6. Who will be the dark horses of the competition? Us, I hope! Failing that...I dunno, I'd like to see Huddersfield do well this year. Seemed to work well enough! 8. Final league position of your club? Probably 7th, hopefully higher. 9. What (or who) will be your clubs weakness next year? A combination of travel hurting us, tiredness as the season wears on, and getting screwed over by officialdom. 10. Who promoted from Championship? Toronto probably, though I'll be pulling for Toulouse. Old Trafford obviously, but I was made up with the Eng v NZ series win as well. The lowlight was the CC QF at Warrington when Wigan got absolutely battered. A bit left field, but the prop from Barrow (Joe Bullock) has looked very impressive in the friendlies. Used to be a winger in the Wigan Academy but has bulked up a LOT. Gawd knows what will happen with Hardaker - Man of Steel or Man in Prison. Who knows! He's got better with age in my opinion, doesn't quite have that savage pace from his early Wigan days but he has transformed into a decent half. I guess that's where we will see him play for Catalan? That Eng v NZ series was great! Really enjoyed the game at Hull (the only one I went to) and the others in the series. Was tempted to go to that friendly in Leigh...but...cold winter Tuesday night? Nah. Couldn't be bothered, despite the fact its 5 mins drive from me! Still feel sorry for Wane. That was a man who was pushed out and was such a shame. Really happy for him winning at OT. It was kinda a massive two fingers up to Lenegan in a way I suppose. His post match interview was a tough watch. Not quite sold on Hastings yet. Yes he impressed towards the back end of last season, but ultimately he was playing in games against poorer teams. We will know more about him this year, he may well be as good as people think. Sammut to Wigan was a proper bolt from the blue! Kinda feel sorry for the Broncos in that they lost their crafty playmaker to a side that perhaps, and this is going to sound disrespectful to Sammut, but Wigan could "do better". Don't get me wrong, I'm a massive fan of Sammut, always have been since his Crusaders days. Crafty little player and will do a job at Wigan. Wigan on -2 points straight away - apparently went over the salary cap by £15k in 2017. Seems a bit harsh for so little, but looks like they tried to cover it up. If that's the case then they had it coming. Might have an impact on the end of season shake up if its as tight as it looks. Its only just breaking on RLFans but should be a nice 20 page thread on the VT in about 30 minutes. Have they said anywhere yet whether or not they'll appeal it? RLFans is an absolutely hideous forum. I hate it. Every single part of it. Its moderated APPALLINGLY. Their mod team just do not care, trolling and obnoxious rows just run wild throughout and there is really very little interesting debate. What interesting debate there is is quickly ruined by bickering, arguing and trolling. Its painful. I go on the HKR fans private forum and its much more of a sanctuary, largely free of all of the above, run by good mods whom some have working relationships with the club (though it remains unofficial) and we sponsor a player each year, this year its Will Dagger. One of the owners also occasionally posts on there (Rob Crossland) which is always interesting. Wigan have said they will appeal. The RFL are in a lose-lose situation here, imagine the uproar if it gets overturned. It looks like an admin error from Wigan, but there's not a lot of symapthy for the club out there (you get used to it tbh), and they do have form for this. Best to shut up and take it. From a PR point of view, there was surely a better time to release it. The decision was made last Friday. Why did it come out today? On an unrelated note, if you can get access to RugbyAM on Sky /Virgin etc, they ran a great piece on the prep for the tour of PNG. Highly recommended. Hopefully a good game tonight to start proceedings. Looking forwards to it and got the beers in! Difficult to predict this one. Probably Saints to win, but that's only because I have literally no idea how Wigan will go with the recent important losses from their squad and obviously no Shaun Wane. Under normal circumstances I'd say St Helens to win, but if Wigan can harness a bit of anger about the point deduction and focus it then that might tip things in their favour. Grumble grumble grumble got relegated grumble grumble. Two of our keys players also got injured in the last week, and we're still trying to get bought out with no senior management as they all resigned! Its looking to be quite a competitive year in the championship this time around. Toronto are looking ludicrously strong this year and probably better coached. Can't see past them getting promotion, but stranger things have happened...London getting in SL for example! Bradford, Widnes, York, Toronto and Fax will all be good battles (hoping for big things from York, but they may struggle a bit more since HKR are no longer their dual reg partner). York just seem to be a good growing club that are going about things the right way, both on and off the field and are a bit of a breath of fresh air, not to mention they are in the process of getting a nice shiny new stadium. York v Toronto live on Sky Sunday afternoon. That will be a cracker too. I have no idea how Wigan will go either, but here we go! Mostly St Helens as I type this. Though Wigan got it level by half-time. 12-12 right now. I think RL massively miss a trick with the scheduling of games. There should be only one game on when its on sky, that way all the speccies of other teams would watch it on sky as they wouldnt be at their own games. So have tv game thurs, fri then all other games non televised on sunday afternoon. Should bump up sky viewing figures a touch. Decent game that. Shot clock really made a difference. Each half about 45 mins total, so much better. I also really like Wilkin and JJB on sky. Need more cirrent sl pros on sky doing commentary. Its a win win in so many ways. Was Sammut injured? Was looking forward to seeing him play. He could have been the difference.